Will the project have to get smaller or stay the same? Will the state water contractors be able to afford the project without federal Central Valley Project (CVP) water contractors ponying up? If so, how? Can the California Department of Water Resources (DWR) force State Water Project (SWP) contractors to support WaterFix even if it’s against their wishes? Will project customers getting Delta imports have to pay higher property taxes for the project? It would seem there is more chaos within the California WaterFix fortress than usual. Outside its walls where financial and water operation plans for the project are hidden from public view by Governor Brown’s Department of Water Resources, the political battle over Waterfix continues. Hopes that “the project is dead,” however, are definitely premature. For one thing, Zone 7 Water Agency in southeastern Alameda County (based in Livermore) voted 5-2 on September 20th to continue participating in WaterFix through the (SWP). They even approved $250,000 of ratepayer money for gap funding for WaterFix through the end of the year. Since their creation in the 1960s, Zone 7 always heavily relied on Delta imports through the SWP. About a century ago, San Francisco and cement aggregate mining companies colonized and depleted their water ways and groundwater: colonizers begat another colonizer, seeking control this time of the Delta. Where will the curse of California water colonization stop? The curse is the belief by California water agencies at all levels of government that, once they fully exploit their local water resources, they can always take waters from other parts of our beautiful state for their selfish purposes—that their economic might makes for a right to do such things. Such a belief is the arrogance of a colonizer. As the Pulitzer Prize-winner Alice Walker wrote about 30 years ago: only justice can stop a curse. But hold that thought for a moment more. Not only was Westlands the first CVP contractor to drop out, it was the largest and wealthiest. So if much smaller CVP water districts and towns wanted water from WaterFix, their costs would dramatically rise. It would not pencil out for them. For an unfamiliar reader, financing consists first of finding ways to pay all the upfront design and construction costs—the “capital costs” of the project. Capital costs are like the window sticker on that car you want to buy. Then there are the costs you have once the project is up and running. These are “operating and maintenance” (also known as “O&M” costs): the costs of tune-ups, smog checks, new tires, new batteries, oil and lube jobs—you get the idea. Like cars, water projects have capital costs and they need tune-ups. The failure of the SWP’s Oroville Dam spillway last February is an example of what happens when a poorly designed spillway collides with DWR’s lack of O&M upkeep: You get nearly 200,000 people spending a cold Sunday afternoon suddenly evacuating Oroville in a massive traffic jam, followed by another two days of worry that your home and livelihood could be gone, should the dam fail too. Thankfully, that didn’t happen, but still. Waterfix’s window sticker shows it costs $16.7 billion in today’s dollars. Before Westlands bowed out, elected board members of state and federal water contractors were told by DWR and MWD that the project’s financing would break down so that the state water contractors would be responsible for 55 percent of WaterFix costs, the federal water contractors (like Westlands) 45 percent. Westlands Water District is far and away the largest south-of-Delta water contractor in the federal CVP. Each year they seek (but seldom get nowadays) about 1 million acre-feet of water from the Delta with which Westlands and other farms irrigate crops along Interstate 5 between Firebaugh and Kettleman City. This spring, the United States Bureau of Reclamation, which owns the CVP, declined to require any of its south-of-Delta contractors to participate in WaterFix. Congress has not given the Bureau any authorization or funding for the project. If the Bureau’s water contractors, including Westlands, wanted water from it, they would have to “opt in” and the Bureau would help account for their payments and water allocations from the project once up and running. So, Westlands’ no vote raises many questions about what becomes of WaterFix. Most likely, WaterFix becomes strictly a state facility owned and operated for SWP contractors by DWR. But this also means that SWP contractors (including Zone 7 and Santa Clara Valley Water District) just saw SWP costs for the project rise from 55 percent of its window sticker to 100 percent. It quickly became less affordable, and some water district officials sense chaos—the uneasy feeling that the financial rug has been pulled out from under them. MWD thinks they can afford just about anything. And they play to win with WaterFix. They don’t like facts that undermine their chances of winning. The largest SWP contractor in California is the Metropolitan Water District of Southern California (MWD). They typically take about 47 percent of project water each year, and they are by far the wealthiest water district in the state. As a water district, MWD is the 1 percent upper crust. MWD buys imported water from the Colorado River and through the SWP, from our Delta. •	Regulatory risk—Changes to state and federal Delta water rights (now under the microscope of the State Water Board) could lower the project’s yield without reducing its costs. •	Climate change risk—No one knows how often WaterFix will take its vaunted “big gulps” or if the state’s water system storage will outlast the long-term droughts expected in the decades to come. •	Legal risk—DWR is now in Sacramento Superior court seeking permission to use an 84-year old law to issue revenue bonds for WaterFix. The outcome of the “validation” suit is only in early stages. •	Financial risk—And Westlands’ action yesterday raises many questions about what becomes of WaterFix. Santa Clara Valley Water District staff rated California WaterFix as the highest risk project in the District’s portfolio of water supply master plan projects, including its potential for cost overruns during construction. Having damaged the life and quality of Delta waters with the State Water Project since the 1970s, WaterFix would tighten the grip of these two colonial powers further. It makes little difference that these colonial powers are domestic, rather than foreign in origin. At Restore the Delta, we think WaterFix is bad not only for the Delta but for most Californians who are now dependent on imported water from the Delta: Some 25 million people south of the Delta are reliant on it for about 30 percent of their overall supplies—in Santa Clara County, in the Hanford to Bakersfield area of the San Joaquin Valley, and from San Luis Obispo to the Mexico border, and inland to San Bernardino and Riverside counties. Runoff into the Delta watershed is declining with climate change, meaning there will be less water to export to these millions of people in the years to come. WaterFix is bad for the Delta because it will impose even greater colonial rule by water agencies—DWR and MWD in particular—over Delta rural and urban life. Having damaged the life and quality of Delta waters with the State Water Project since the 1970s, WaterFix would tighten the grip of these two colonial powers further. It makes little difference that these colonial powers are domestic, rather than foreign in origin. They rule Delta waters already with as much impunity as they can get away with—and with MWD having bought five Delta islands in 2016 (apparently without benefit of an appraisal), they fully intend to tighten their grip on Delta waters for more exports to the south. WaterFix is also bad because it will make all of MWD’s customers complicit in colonial control of the Delta. Most do not understand now that this would be and already is done in their name. It will be an ecological, political, and economic curse upon the people of California to allow Delta colonization to fester and grow. It will also cost them more in their water bills than they are being told by MWD’s shills. 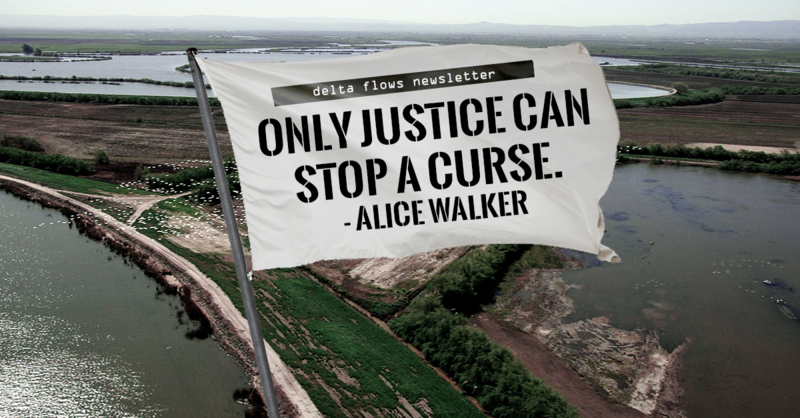 Restore the Delta’s recent organizing efforts with our southern California friends too numerous to list here have been aimed at defeating further colonization of the Delta by these colonial water powers. The time is now. The end of September and early October are when wealthy state water contractors MWD and Santa Clara Valley Water District in San Jose decide on WaterFix. Restore the Delta is in this fight to stop the tunnels of WaterFix, just as much as MWD is in it to win. Santa Clara seems somewhat less confident now than does MWD, but several board members seem more worried about pleasing state officials and the Silicon Valley Leadership Group instead of listening to and representing the interests of the majority of their constituents. We don’t know what will happen with the upcoming votes at these two important state water districts. But from their vote tallies, we will learn how much our David versus Goliath efforts undercut political support for the horrible WaterFix. Will we be able to undercut these massive powers like we watched this winter’s erosive destruction undercut Oroville Dam’s spillway? The days ahead will tell. RTD and our friends learned that by organizing we could accomplish quite a bit against these water Goliaths. Whatever the eventual outcome—whether WaterFix dies, or it becomes a State Water Project burden for litigation, or morphs into some other as yet unimagined form—we will at least know that more and more Californians are standing together against this terrible colonial project, and in that there is much hope for California’s future. We hope to see you on September 26th either at Santa Clara Valley Water District in San Jose, or at Metropolitan Water District’s politburo headquarters by the Union Station in Los Angeles. We will be there seeking justice, for the Delta, and for the millions of Californians who do not know about the political and financial debt that they and their future generations will be saddled with. We do this work from love for the Delta and California. Justice and love. This is what we have. Editorial: Now Gov. Brown threatens to force us to pay for Delta Tunnels? Enough is enough…What srtuck me is the capital costs for maintenance which is the weakest budget item and action plan in our local municipal water districts …except raise costs for water service for changing water meters that don’t account for all the water they waste by not fixing their side of the water pipes and joints in the streets…Fix the management of the water municipalities first then move on to the next level and stay away from political colonization of our water in California. The strategic plan should include math algorithms that set consumption levels and price levels based on those projections. The Delta was not built for Southern California…lets remember what it was built for!!!! Good article, Barbara! Thank you.